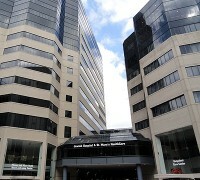 The University of Louisville Hospital's mission encompasses patient care, education and research. It operates the region’s only Level I Trauma Center. There are 404 licensed beds; full invasive and noninvasive laboratories are available, as well as a cardiovascular surgical program. It is the main provider of care for indigent patients and serves as a tertiary referral center for the state with an active Stat Flight service. Cardiology facilities include a 10 bed CCU and a 26 bed Transitional Care Unit. Invasive cardiology services include fully equipped cardiac catheterization laboratories and a separate laboratory for electrophysiology studies and permanent pacemaker implantation. 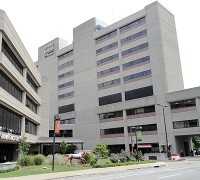 University of Louisville Physicians are proud to serve patients in this state-of-the-art, multi-specialty health care facility, located at the corner of Preston and Chestnut Streets in downtown Louisville. Practicing University of Louisville Physicians are some of the best minds in medicine, dedicated to making a difference in the quality of life of their patients and throughout the region. The Robley Rex Veterans Affairs Medical Center improves the health of veterans and other eligible patients by providing a continuum of care through an integrated health care delivery system. This is a 266 bed teaching facility ten minutes away from the medical campus. 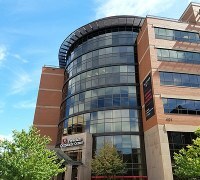 It is fully affiliated with University of Louisville Medical School and has 80 residents. 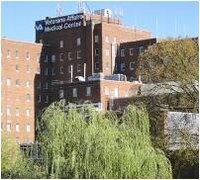 There are over 200,000 Veterans in the VAMC primary service area. Cardiology facilities include an eight-bed CCU, ten-bed telemetry unit and a state-of-the-art catheterization and electrophysiology laboratory. 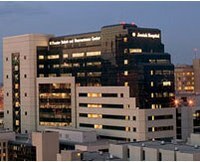 Many of Jewish hospital’s clinical programs have achieved national rankings for excellence. Noted for numerous medical firsts in Kentucky, the nation and the world, Jewish Hospital is the site of the nation's first four hand transplants, and the world's first and second successful AbioCor™ Implantable Replacement Heart transplant. The hospital is federally designated to perform all five solid organ transplants - heart, lung, liver, kidney and pancreas. The Heart and Lung Institute, located in the Rudd Heart & Lung Building, offering the most complete range of cardiovascular and pulmonary services available anywhere in the region. The Institute is also home to multiple clinical trials, bringing the latest medical advancements and research to the bedside. UofL Physicians-Endocrinology provides sophisticated, cutting-edge diagnostic and therapeutic care for patients with a broad range of hormonal disorders in the Louisville, Southern Indiana and greater Kentucky areas. Our endocrinologists see patients from all over the United States, as far away as New York and Pennsylvania, with complicated endocrine disorders. We treat endocrine diseases, including those of the pituitary gland, thyroid, parathyroid, adrenal gland, testes and ovaries, as well as diabetes, hypoglycemia, dyslipidemia (high cholesterol) and disorders of calcium metabolism including osteoporosis. UofL Physicians-Endocrinology is dedicated to advancing the care of patients with endocrine disorders and diabetes in the greater Louisville region.